In May 2016, I met a client who had a one bedroom apartment to sell. We listed the property and achieved a suburb record in just five days! Admittedly, the property was in a prime location, was immaculately presented and stock was low at the time. But the difference between the offer that was accepted and the sales price of the highest comparable sale was $70,000. The selling price was at the top end of the range I had initially pitched when I won the listing, and close to $100,000 higher than the vendor thought was achievable. You see my mantra to clients is I will strive to get you the best price not the market price. I will take the stress out of the process and advise you all the way, providing you with the best options to choose from. Achieving a great price or suburb record is only one part of the equation. The key to the sales process is all behind the scenes. You see I have a secret weapon, one that I have tested for decades; one that is guaranteed to identify and attract the buyers who are most likely to pay the highest price. It’s the one thing that will deliver to my clients (the vendor) the best price in a speedy fashion. Anyway, back to my story of how one coffee lead to five listings. So we list, we qualify buyers, negotiate and sell for a suburb record…. all in 5 days. The buyer pays well over what they thought they would, but because I did my homework I knew what he could pay and why he would pay it. The result? He had to sell his place and insisted I sell it for him. Listing #2 was not a slam-dunk. It was in a block of units where there were three other similar properties already for sale and they had been on the market for a few months, and one for six months. I’ll spare you the details, but yet again due to my well-tested buyer management program we achieved a price of $90,000 over the client’s expectation and my marketing campaign helped bring in other buyers to sell the remaining apartments within the same block that were listed with other agents. The reaction I got from this vendor was that on the night of exchange he wanted to door knock his neighbours promoting my services. Unfortunately for me his wife intervened and I had to settle for a video testimonial. Meanwhile, another vendor calls me about Listing #1 wondering how I managed to get such a high price. We met, we chatted and we listed. Two weeks later Listing #3 sold well above her expectation and achieved a price of $75,000 more than she thought was realistic and $100,000 more than the other local agents had suggested. Then the sister of Listing #2 calls me and insists I list her property. Again, I wont give you the boring details of the campaign, suffice to say that we had twice as many groups through the property as the place that sold the week before, and we sold Listing #4 at the top end of my range in just 6 days. Next, the daughter of Listing #1 calls me and tells me she wants to sell her property. We meet for another coffee and agree to list Listing #5. This is a work in progress but I am confident that the outcome will be a positive one. Properties 1, 3 and 5 were in suburb A. Properties 2 and 4 were in suburb B. The distance from suburb A to suburb B is 26.1km or 41 minutes by car when traffic is good. So my message to you is that it is not the local knowledge, it is not the unique property, and it is not the time in space that drives a great outcome. Common perception is that the best agent is the one who sells the most properties each month and who is the local expert in the market. My results suggest that the local market is not the juice that gets the job done. It is the buyer market that I create by my marketing campaign and my buyer management program that then engages this market and gets great results. I couldn’t do the job I did for these people if listed more than three properties at a time. I limit my workload so I can be “high touch” for my clients. And because I own my own business I keep most of the commission unlike many agents who keep only 30-50% and have to do greater volumes to pay their bills. I sold four properties in rapid fire, yielding great outcomes quickly. I’m talking about a cumulative value add of $310,000 over vendor expectations. I also got great referral business and was head hunted because I did a job that was beyond my client’s expectations. My vision is to change people’s poor perception of real estate agents – one by one. For the last 20 years a Roy Morgan has suggested only 9% of people trust real estate agents. I would bank the notion that my clients trust me 100%. Trust is everything to me. Without trust I would not have a reputation. Without trust I could not negotiate with buyers and create great outcomes for my clients. 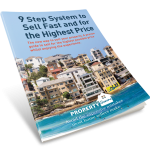 This free special report entitled the “9 Step System to Sell Fast and for the Highest Price” shows you why 90% of property sellers select an agent that is most likely to undersell your property by $30,000, $50,000 even $100,000+. + You’ll also discover the 5 little known agent interview tips to ensure you find the agent who wants to look after your interests ahead of theirs and who also has the ability to do so. You only get one chance to sell your property. How long would it take you to save $30,000, $50,000 or $100,000? Go ahead and request your FREE copy today and it will be posted to you immediately.